This apartment is part of the estate Molino Los Justos, nestled between olive groves, near the Lake Iznajar in the province of Granada. This is an ideal place for a few days rest in the countryside. This apartment was formerly one of the buildings around the old mill and the owners decorated the apartment carefully in typical rural style. The house has a cozy fireplace in the kitchen for the cooler evenings in the winter. On the patio of the property is the terrace, but you can also use the communal bar-restaurant. There you'll find wireless Internet access. Additionally, you can buy local produce here or attend a workshop for typical dishes. You can also have breakfast and lunch. The surrounding nature offers the possibility for different activities. Guests can cycle on the roads and paths of the Park Cesna. Cast your fishing rod out in lake Iznajar, where you can also sail. You can also go rafting in the area. Ask the owners for tips. This apartment can be combined with La Casa Vieja. 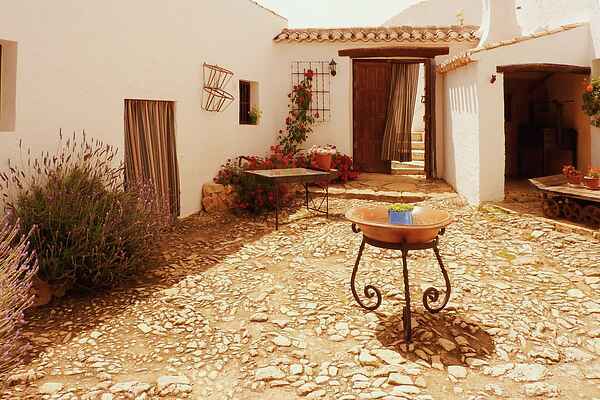 LAST FRONTIER OF AL-ANDALUS The accommodation is located just 1.5km from the pueblo of Fuente de Cesna and the surrounding area forms part of the Poniente Granadino region, the most western part of the Province of Granada. The region is rich in areas of archaeological interest and is encircled by the Sierra of Cordoba to the north, the Axarquia of Malaga to the South and to the west, the Valleys of Archidona and Antequera. ALHAMBRA The Alhambra, just 80 minutes away by car, overlooks the City of Granada and attracts many thousands of visitors each year. The walls of the Alhambra enclose an entire citadel comprised of palaces, baths, a fortress a mosque and beautiful gardens. Welcome to the historical monument and grounds of the Alhambra and Generalife The Alhambra was a palace, a citadel, fortress, and the home of the Nasrid sultans, high government officials, servants of the court and elite soldiers (from the 13th to the 14th century). Today, the monument is divided into four main areas: the Palaces, the military zone or Alcazaba, the city or Medina and the agricultural estate of the Generalife. All of these areas are surrounded by woods, gardens and orchards. Other notable buildings belonging to a different time period are also included, such as the Renaissance style Palace of Charles V, which houses the Alhambra Museum (most of the items are from the site of the monument) and the Fine Art Museum. In order to fully appreciate the unique architecture of the Alhambra set within the surrounding landscape, it is advisable to visit an area of the AlbaicÌn called the Mirador de San Nicol•s, or go to Sacromonte. From both of these places the Alhambra's spectacular location, lying just above the city of Granada, can really be admired Alhambra:General information and tickets General information: www.alhambradegranada.org The ticket is only valid for the day of purchase of the ticket. Owing to the great demand of tickets and to the number of visitors per day being limited, advance booking is recommended. Once inside, visitors may remain until the Monument closes. Visitors will be asked to leave the Monument at closing time. There are two types of tickets: Daytime Visit (divided into morning visit and afternoon visit) and Evening Visit. Daytime Visit This includes the areas of the Alcazaba, the Nasrid Palaces, the Generalife, the Mosque baths and Gardens. Visits are divided into two sessions: Morning: From 8.30 a.m. to 2 p.m. Afternoon: From 2 p.m. to 6 p.m. or from 2 p.m. to 8 p.m. (see the opening times). Evening Visit This only includes access to the area of the Nasrid Palaces open to visitors. SIERRA NEVADA The Mulhacén peak, the highest on the Iberian peninsula, rises up to 3,478 metres, an altitude which guarantees abundant, top quality snow despite the fact that Sierra Nevada is Europe’s most southern ski resort. Moreover, this fortunate geographical location guarantees a great many sunny days in the middle of winter. Being awarded the World Ski Championships in 1996 meant enormous international recognition for Granada’s ski resort SUMMER ACTIVITIES In summertime the sunny days and optimum temperatures produce perfect conditions for launching hand gliders, so much so that this sport’s World Championship trials are usually based here. Sierra Nevada is ideal for exploring on foot, by mountain bike or on horseback. Sierra Nevada's Ski resort (fotos Patr. Prov. of Tourisme ) 65 KILOMETRES OF PISTES The resort has 45 pistes of various levels of difficulty, with a total length of 65 kilometres, where one can either ski or go snowboarding. One of the main attractions of Sierra Nevada is that one can ski at night on a specially fitted out, floodlit piste. Further, it also has two 8.6 kilometre cross-country skiing circuits, which can also be tried out at La Ragua, the province’s second winter resort. Quick and easy access to the Sierra Nevada pistes from the Pradollano residential and business area is ensured by 19 modern ski lifts: two cablecars, twelve chairlifts and five actual ski lifts can transport up to 32,000 skiers per hour. Around three hundred snowmaking machines ensure that the pistes are in a perfect state. ALBAYZÍN With its Islamic style architecture the Albayzín area of the City of Granada is an area of beauty, where trailing plants adorn a myriad of balconies and the scent of flowers spills over the many garden walls. Plaza de San Nicolas, within the Albayzín, is possibly one of Andalucia's most famous viewpoints. GENERALIFE GARDENS The Generalife Gardens are a splendour to behold, the senses are engulfed by experiences that render any description of the occurrence almost meaningless to those who have not yet been fortunate to witness such beauty. The Generalife Gardens provide visitors with the opportunity to gaze into the past of this wondrous location as well as daydream of the times ahead.